The Plantronics Savi W710 joins the latest line of Savi headsets to be announced by Plantronics which is changing how productivity-focused business professionals communicate. 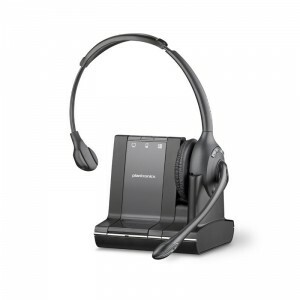 With multi-connectivity, a newly designed monaural headband headset system, extending up to 350 feet of range, the Plantronics Savi W710 can easily manage office phone, computer and mobile calls with the most intelligent wireless headset system in the industry. No longer will you need three headsets in your office and switch between headsets for land line, cellular or VoIP calls. With the Plantronics Savi W710 you put on one headset and you’re done. You’ve instantly connected to your standard office phone, your mobile or cellular phone and your computer for VoIP and unified communications. You’re also getting top of the line quality and performance with the Plantronics W710 wireless headset. The W710 uses an energy efficient adaptive power system which optimizes your range and talk time. The Savi family can conference in up to three additional headsets to bring your office together for simplified conference calling. The Savi W710 single ear headset weights 72 grams and is an excellent headset for all day wearing comfort and with the full sized cushion covering one ear, you will easily hear your caller and by keeping your other ear open, you can stay in touch with your co-workers and surrounding environment. The Savi W710 also provides 9 hours of continuous talk time getting you through your busiest work day. So excited I found this aitrcle as it made things much quicker!